Many classic Thanksgiving dishes are based on an extremely sanitized, peaceful story of Thanksgiving and early American history: the pilgrims came, the Indians greeted them, and everybody celebrated together. That story is not true, which Sean Sherman knows better than most. He was born and raised on the Pine Ridge Indian Reservation in South Dakota. He’s written a new op-ed in TIME magazine about how he’s found a better way to celebrate Thanksgiving. He uses regional ingredients that are all around him, including corn, beans and squash. And he cuts out European ingredients, including dairy and processed sugar. 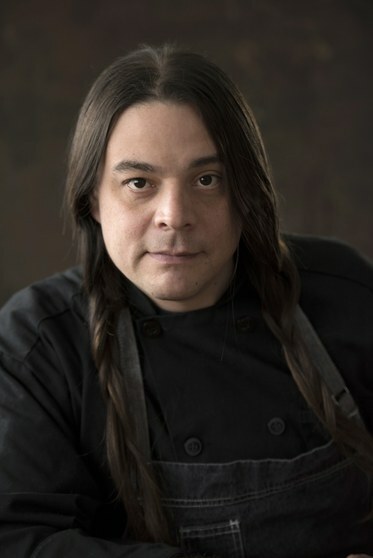 Sean Sherman, chef and member of the Oglala Lakota Sioux tribe. Credit: Heidi Ehalt Photography.